First-year student Henry Muhlbauer kicked off his college career with a full course load, taking classes in electrical engineering, computer programming and chemistry, among his 15 credits. He still made time, however, for his other favorite pursuits: Little League (where he plays first base), training the family dog and BB-gun target practice with coffee cans in the backyard. At 12, Henry may be the youngest student ever to enroll full time at UVA. With a buzz cut and braces, Henry rides in his mom’s Volvo station wagon to Grounds from his home in nearby Earlysville, where his family of five relocated in 2010 when his dad, an electrical engineer in the U.S. Air Force, was assigned to the Defense Intelligence Agency in Charlottesville. Before the move, Henry had attended public elementary school at their last post in England, but from early on it was obvious how far ahead he was. 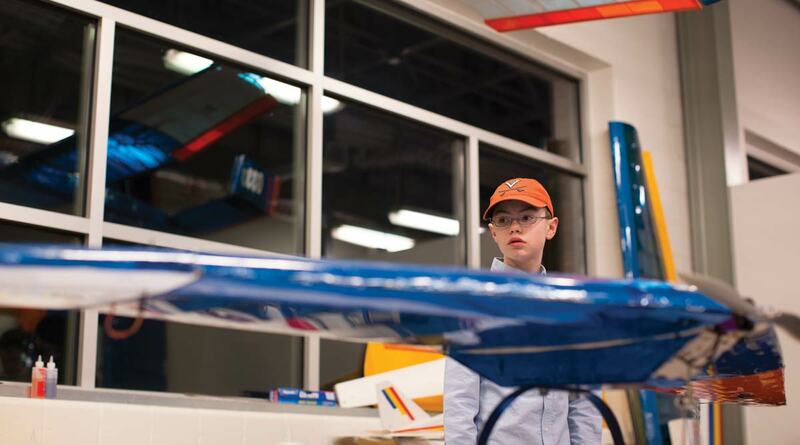 Once in Charlottesville, his parents began searching for opportunities to support and engage then 8-year-old Henry, who on his own had worked his way through an organic chemistry textbook and had moved on to precalculus. His mom contacted Mary Saville (Engr ’97), a former Jefferson Scholar who was teaching a high-school-level pre-engineering class in a homeschool co-op. “This is going to sound really strange to you,” Muhlbauer began, and then asked if her son could take the class. 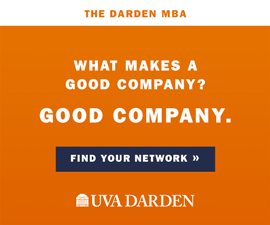 Saville helped connect the family with administrators at UVA, who debated whether to allow him to enroll in his first class, Multivariable Calculus, at age 10. Weikle met Henry and found him to be well spoken, mature for his age and respectful. The professor gave him a textbook to use over the summer, and Henry worked through many of the problems. By then, he had already immersed himself in calculus with books his parents had bought. “He taught himself calculus 1 and 2 in about eight weeks, sitting at the dining room table,” says his dad, Tom Muhlbauer. “He was one of the few students who was not afraid to interrupt me and ask questions,” Weikle says. Weikle, who is now Henry’s academic advisor, continued to have discussions with Henry’s parents about how best to meet his educational needs. By the time Henry enrolled full time last fall, he already had 41 course credits and 16 AP credits on his transcript. 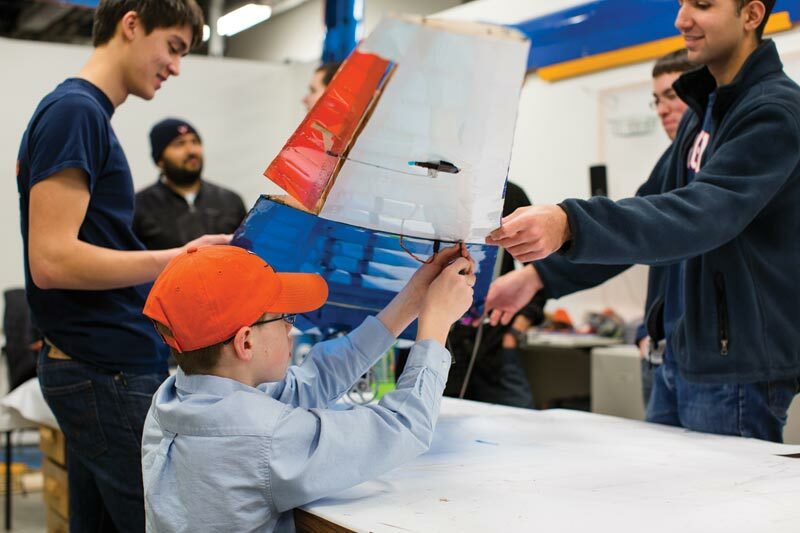 “We’re fortunate to have Henry here, because there are a lot of other places, I’m sure, that would like to have him as part of their university,” says Professor George L. Cahen (Engr ’70, ’76), associate dean for undergraduate programs in the Engineering School, who taught Henry in his materials science class. Since enrolling full time, Henry has declared electrical engineering as his major, with minors in physics and applied mathematics. He’s thinking about double-majoring in computer science, too. And at the start of this semester, he was awarded the William Tyler and Gay Caskie Ross Scholarship, which will cover his tuition and fees in full. 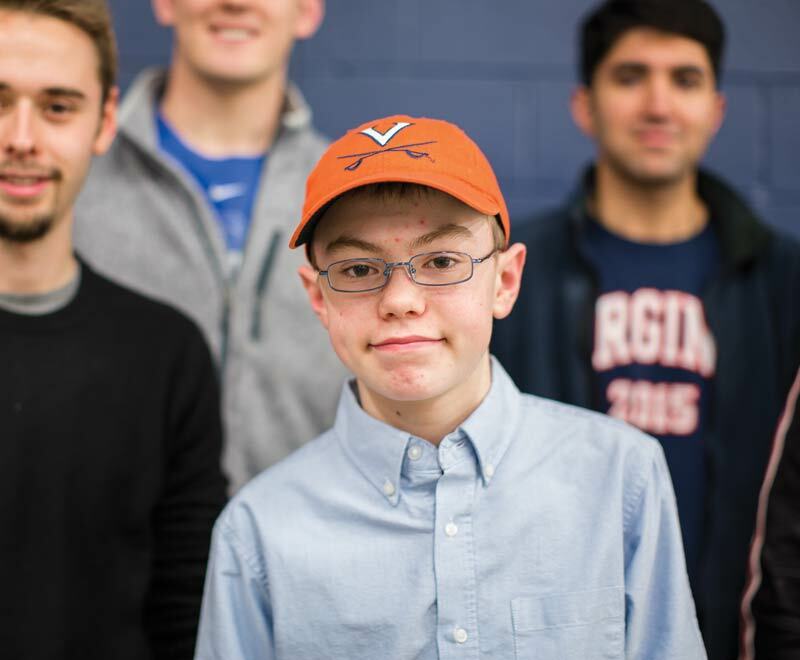 Aside from academics, Henry has delved into other aspects of UVA life, too—sitting with other first-years in the student section at Scott Stadium and playing on the Engineering School’s kickball team (which he says he signed up for to get a free T-shirt). “I feel like I belong here,” he says. He has even joined the Alumni Association, enticed by the free parking at Alumni Hall during football games. He is the youngest member that the association has ever had. Grad school. For what? That’s yet to be determined. To pave the way toward grad school, Henry hopes to work grading papers to contribute to his expenses. But he can’t just yet. Virginia labor law dictates a minimum age of 14 for such work. Wow! This is awesome! 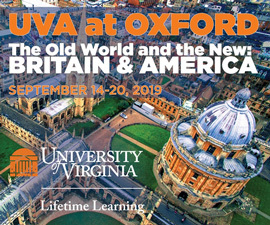 UVa was hard for me at ages 18-22. Truly a gift and I look forward to hearing more about Henry, my fellow Hoo, in the future. This is a wonderful story! We are so lucky to have Henry as a part of our community. Thank you for writing this Michelle, it is truly an awe-inspiring story. Best wishes to both Henry and his family!! It’s good to read a “Good News” story. Congratulation to Henry and his family. I’m sure his parents are very proud of him. I look forward to reading more on Henry in the future.